Photographer’s notes: We all have these moments. A person goes by and a photo starts screaming in your head. People who are so visually striking, so out of the norm in their design, that a request has to be made. I lose my nerve, sometimes, with people so striking. This time, I swallowed my anxieties and asked… and was given permission. I really think this bike is World War II leftovers. The huge headlamp, frame design, fenders. It just states vintage. I was at the Place Jeu de Balles market in Brussels and saw the rider walking though the stalls and had to ask for a photograph. The bike and rider seem to well-suited together. Nice to see. 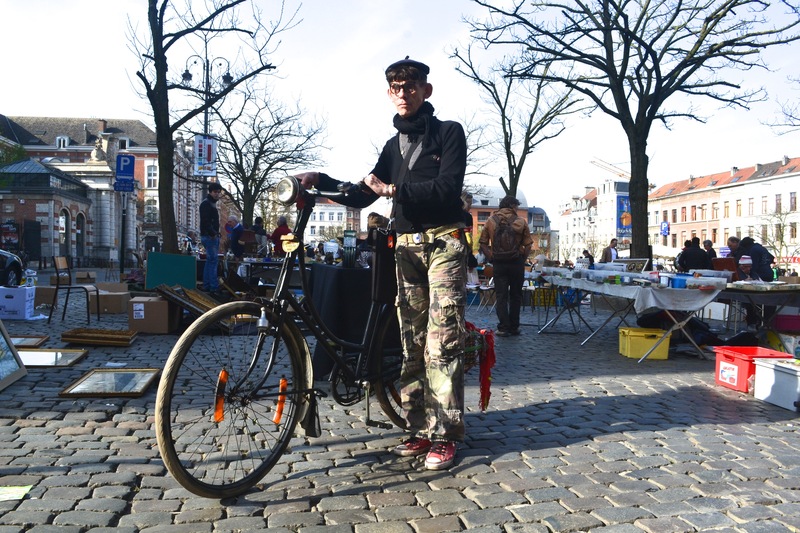 This entry was posted in city bike, commuter, eccentric, Europe, vintage and tagged 2015, April. Bookmark the permalink.